I made a how-to tutorial video on how to create a natural smokey eye look for asian eyes. Just because I say it's for asian eyes, it doesn't mean anyone with any type of eyes can't do this as well. There are not a lot of tutorials for almond shape eyes like mine, especially when you don't have that existing crease fold! Please enjoy the tutorial on my YouTube video - www.youtube.com/marinamoua. Make sure to subscribe to my YouTube channel if you like what you see and my beauty blog here on www.marinamoua.com. Thank you in advance and ENJOY! For the natural smokey eye look I used the first ever Naked palette from Urban Decay, available at www.urbandecay.com or any Sephora stores. 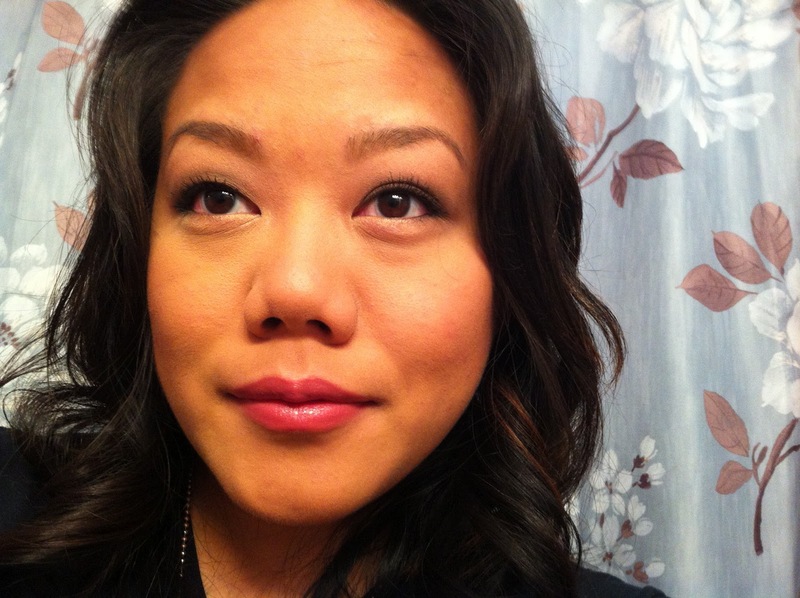 At the time I bought the Naked palette it came with a duo 24/7 Glide-On Eye Pencil in black and brown. Now it comes with an eyeshadow brush. I used a wide variety of brushes, from Trish McEvoy, Sonya Kashuk, Aveda, and Sephora brand. Let's not forget to always prep the eyes first so it lasts you all day! I love using the Eyelid Primer - Prime Time from BareMinerals, available at any Bare Escentuals stores or Ulta stores. My black liquid eyeliner is a Maybelline Eye Studio Master Precise Liquid Liner in black, available at any drug stores. I recently just bought a Kevyn Aucoin Beauty Eyelash Curler available at Nordstrom, and I love it because it has a wider curve so it's less likely to pinch your skin - ouch! 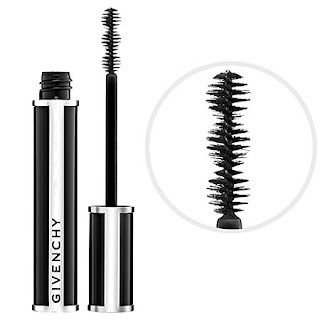 I don't have my mascara pictured in the photo below, but I used the new Givenchy Noir Couture 4 in 1 Mascara. It creates volume, curl, length, and lash care. It has a Lash Booster Expert Complex that provides nutrition, revitalization, fortification, and protection. My natural smokey eyelook products and tools. Givenchy Noir Couture 4 in 1 Mascara, available at Sephora. Courtesy of www.sephora.com. Step 1: Prep your eyelid using an eye primer, apply it from the lash line all the way up to the brow bone. 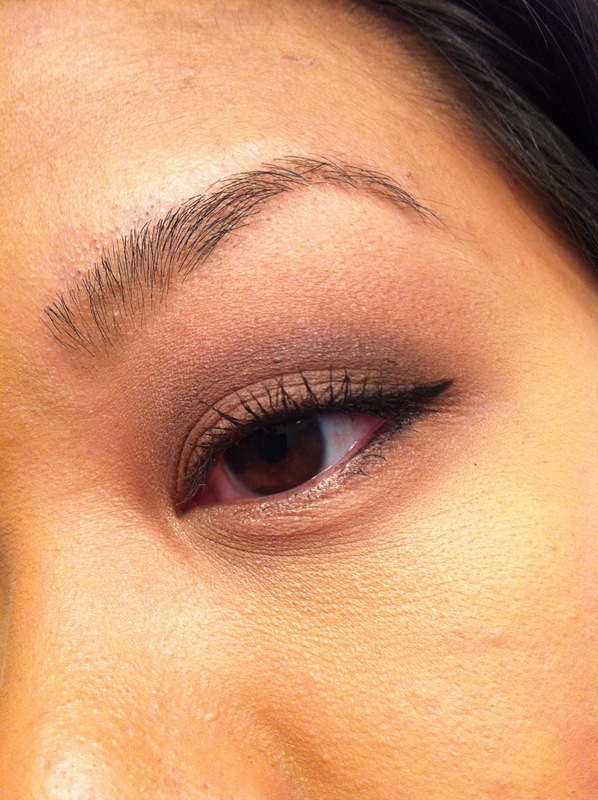 Make sure to also get the inner corners of your eyes and below the lower lash line for an ultimate no smudging! Step 2: Using a large eyeshadow brush sweep a semi-matte neutral eyeshadow from the lash line to the brow bone as a base. 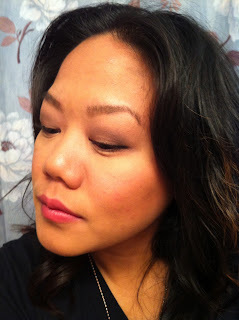 I used Trish McEvoy's Deluxe Eyeshadow in Soft Peach, available at Nordstrom or www.trishmcevoy.com. Step 3: Now using my Naked palette I used an angled creased brush with eyeshadow Naked (a matte beige) to press and sweep on my eyelid - from the lash line to the mid of my eyes. Step 4: I used a medium eyeshadow brush to apply Smog (a shimmery bronze) pressing it on my eyelid, only where I can feel my eyeball. Make sure you don't apply it pass the back of your eyeball shape. Tip: Pressing the eyeshadow with the brush is going to give deliver more pigment, sweeping the eyeshadow is going to give you a sheer blended effect. Step 5: Next I used Buck (a matte medium brown) with a tapered crease or pencil crease brush to use a sweeping technique back and forth (like a windshield wiper) on the back of my eyeball to create a round shape that will look like you have a crease. 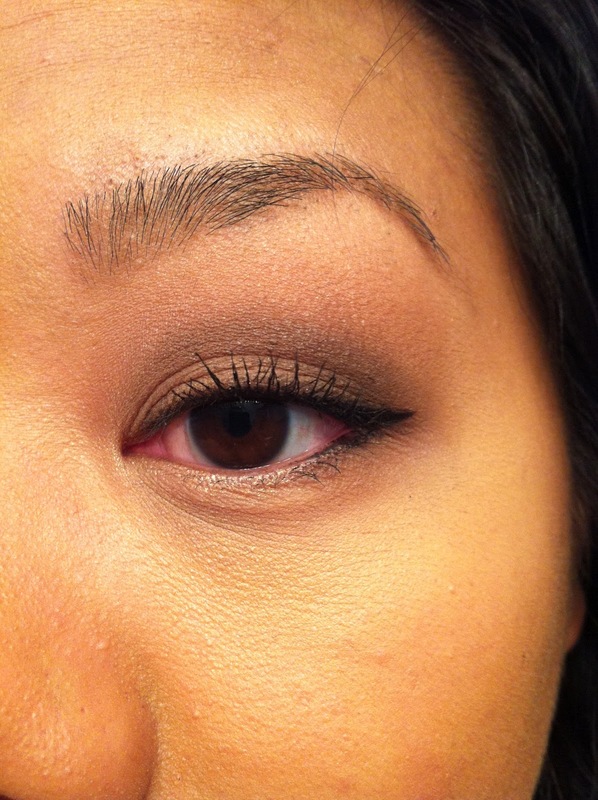 With some of the left-over eyeshadow, sweep it on the outer lower corner of your eyes. Tip: The back of your eyeball will determine the shape of an non-existing crease, unless you already have a crease. Step 6: Using a medium smudge brush, I apply Smog into my outer upper lash line. Extending it from the middle of the lash line to the outer corner of your eyes to deepen the outer corners. 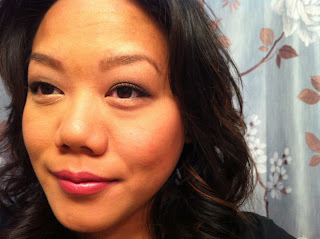 Add a little smudge on your outer lower lash line to contour the eyes. Step 7: To blend I used a fluffy crease eyeshadow brush with the color Naked. Swirl it back and forth above where you have applied the eyeshadow Buck to blend it in with the previous color Naked. Step 8: I highlighted my bottom lower lash line and inner corner using Half Baked (a shimmery gold) with a thin eyeliner brush. Step 9: I then created a tight line on my whole upper lash line and my bottom lower outer lash line with the 24/7 Glide-On Eye Pencil. I made sure to connect the outer corners for a no gap effect! A tight line is creating a thicker fuller look for your lashes by applying eyeliner below your lash line and between your lashes. Step 10: Using a pointed liquid eyeliner pen, I dotted where I wanted my cat eye liner to extend to. Then I connected the point to two different ways, the outer corner of my eye and the mid of my lash line to create my cat eye! Fill in that little triangle with the liquid eyeliner. Step 11: I curled my lashes using an eyelash curler, pumping it about 3 to 5 times to create more curl. I then applied my mascara by using the tip of the wand sweeping it back and forth from inner to outer corner (this technique distribute more product on your lashes). Lay your mascara wand horizontally parallel to your lashes, and apply to it by wiggle upwards and side to side (it helps separate the lashes and coats every strand). Step 12: My last step to finishing my natural smokey eye look is to fill in my brows. Using an angled brow brush with eyeshadow color Buck, I used small strokes starting from the outer brow to the inner brow. Tip: Starting from the outer brow first will deliver more depth, meaning darker, and then stroking the rest of the product on your inner to create a blended natural look. Step 13: Finish off your look with a neutral lip color, and a neutral blush. I used a neutral pink lip color because my natural lip color has pink tones to it. 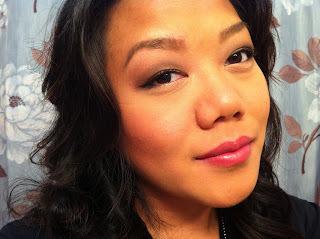 And for my blush, I actually used my bronzer to contour my face and add to the apples of my cheeks. Here's an up-close picture of my natural smokey eye look. Add me as a friend on facebook and twitter!